Since the Portuguese colonized Brazil in the 16th century, it has been overwhelmingly Catholic. 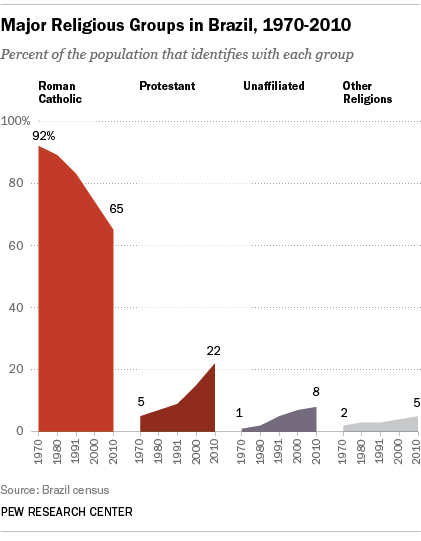 And today Brazil has more Roman Catholics than any other country in the world – an estimated 123 million.1 But the share of Brazil’s overall population that identifies as Catholic has been dropping steadily in recent decades, while the percentage of Brazilians who belong to Protestant churches has been rising. Smaller but steadily increasing shares of Brazilians also identify with other religions or with no religion at all, according to a Pew Research Center analysis of Brazilian census data. 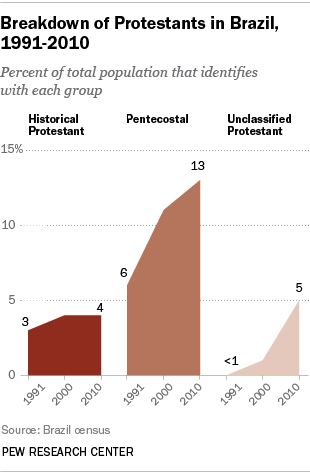 The number of Brazilian Protestants, on the other hand, continued to grow in the most recent decade, rising from 26 million (15%) in 2000 to 42 million (22%) in 2010. “Protestant” is broadly defined here to include Brazilians who identify with historically mainline and evangelical Protestant denominations as well as those who belong to Pentecostal denominations, such as the Assemblies of God and the Foursquare Church. It also includes members of independent, neo-Pentecostal churches, such as the Universal Church of the Kingdom of God and the God is Love Pentecostal Church, both of which were founded in Brazil. But in keeping with categories in the Brazilian census, it does not include Mormons or Jehovah’s Witnesses. In addition, the number of Brazilians belonging to other religions – including Afro-Brazilian faiths such as Candomblé and Umbanda; spiritist movements like the one related to the late Chico Xavier; and global religions such as Buddhism and Islam – has been climbing. About 2 million Brazilians belonged to these other religions in 1970. 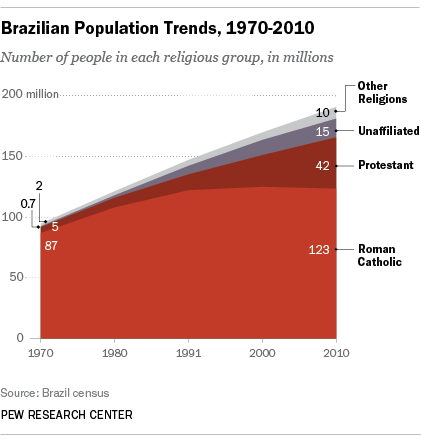 By 2000, adherents of religions other than Catholicism and Protestantism numbered about 6 million (4% of Brazil’s population), and as of 2010, the group had grown to 10 million (5%). Finally, the number of Brazilians with no religious affiliation, including agnostics and atheists, also has been growing. In 1970, fewer than 1 million Brazilians had no religious affiliation. By 2000, that figure had jumped to 12 million (7%). In the most recent decade, the unaffiliated continued to expand, topping 15 million (8%) in Brazil’s 2010 census. The rapid growth of Pentecostals and other Protestants in Brazil cannot be explained fully by demographic factors, such as fertility rates or immigration. Brazilian census data from 2000 indicate that total fertility rates for Protestants are about the same as for Catholics.3 In addition, less than 1% of Brazil’s population is foreign born – too small a percentage for immigration to make a significant difference in the religious composition of the country as a whole. Catholics have decreased as a share of Brazil’s population while Protestants have risen among men and women, young and old, people with and without a high school education, and those living in both urban and rural areas. But the changes have been particularly pronounced among younger Brazilians and city dwellers, as shown in the tables below. For example, the percentage of Brazilians ages 15-29 who identify as Catholic has dropped 29 percentage points since 1970, and the share of Catholics in Brazil’s urban population has fallen 28 points. Brazilian Catholics tend to be older and live in rural areas, while Protestants tend to be slightly younger and live in urban areas. Brazilians with no religious affiliation also are younger, on average, than the population as a whole and are more likely to reside in urban settings. The remainder of this report examines these demographic patterns in more detail. Generational change has contributed to the declining number of Catholics in Brazil. As of 2010, nearly three-quarters (73%) of Brazilians ages 70 and older are Catholic, while fewer than two-thirds (63%) of those ages 15-29 identify as Catholic. 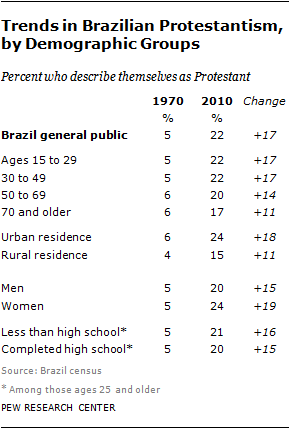 Younger cohorts are somewhat more likely than older Brazilians to be Protestant or to have no religious affiliation. As of 2010, for example, Protestants make up more than a fifth (22%) of Brazilians ages 15-29, compared with 17% of those 70 and older. And 10% of 15-to 29-year-olds had no religious affiliation in 2010, while just 4% of Brazilians ages 70 and older are unaffiliated. Brazil’s overall population has become increasingly urban. In 1970, about half (56%) of Brazilians lived in urban areas; as of 2010, more than eight-in-ten (84%) do. As a result, all of Brazil’s religious groups have become increasingly urban – but some more so than others. According to the 2010 census, about equal percentages of Brazilian men (65%) and women (64%) are Catholic. By contrast, a slightly higher percentage of women (24%) than men (20%) identify as Protestant, while a slightly higher share of men (10%) than women (6%) have no religious affiliation. Similar shares of men (5%) and women (6%) belong to other religions. These gender patterns have become more distinct over time. For instance, the religious profiles of men and women were quite similar in the 1970s and 1980s. But over the past two decades, the share of women who are Protestant has ticked up, as has the share of men who are religiously unaffiliated. Looking at two education levels – completion of high school and less education – there are only minor differences in the percentages of Catholics, Protestants and the unaffiliated in each group. The notable exception is that a greater share of adults who have completed high school belong to other religions (9%) compared with those who have less education (4%). This is particularly true of Brazilians belonging to spiritist movements. As of 2010, the share of spiritists who have completed high school (70%) is almost twice as high as in the general public (36%). The census estimates for 1970, 1980, 1991 and 2000 were drawn from a microdata subsample of the Brazilian census downloaded from the IPUMS-International data service at the Minnesota Population Center. All microdata estimates use weights provided by IPUMS. Estimates for 2010 were downloaded as tables from the Instituto Brasileiro de Geografia e Estatistica (IBGE). Comparable microdata for 2010 are not yet publicly available. There are minor differences between the estimated size of Brazil’s Catholic population in this report and previously published Pew Research estimates. Specifically, Pew Research’s February 2013 report “The Global Catholic Population” estimated the total number of all Catholics in Brazil at about 126 million. The current report focuses solely on Roman Catholics, who number about 123 million in Brazil as of 2010. The difference of 3 million is partly accounted for by independent Catholics, such as members of the Brazilian Catholic Apostolic Church, who account for about 700,000 people. The remainder (about 2.3 million) is due to a small number of missing responses in the census and an adjustment of younger age groups. The age group adjustment reflects the fact that parents sometimes are hesitant to report a religious affiliation for an infant even though they will claim a religion for the child when he or she is slightly older. For instance, the 2000 Brazilian census reported that 11% of children ages 0-4 were unaffiliated. But in the 2010 census, only 8% of the same birth cohort (then 10-14 years old) was unaffiliated. While some of this change may be explained by mortality and migration, it is at least partly due to parents being more willing to describe their older children as Christians. In order to compensate for this measurement bias, previous Pew Research reports applied the religious composition of older children (5-9 years old) to infants and young children (0-4 years old) in Brazil. To maintain consistency with Brazilian census figures for 2010, however, no such adjustment was made in this report. If an adjustment was made to compensate for low religious affiliation rates in the youngest cohort (0-4 years old) of Brazilians, it would slightly raise the number of people in each religious group as of 2010, including Catholics. It also would slightly decrease the size of the unaffiliated group. But the overall trends described in this report – including the rising share of Protestants and declining share of Roman Catholics in Brazil’s population – would not change. This report is part of the Pew-Templeton Global Religious Futures project, an effort funded by The Pew Charitable Trusts and the John Templeton Foundation to analyze religious change and its impact on societies around the world.